If you are starting out in an Android application development company, you might be pretty nervous. And it is justified as for android app development there are so many tutorials, tools and information available. To build an android app, you can use a number of the integrated development environment, languages and a diverse set of tools. But knowing what and how many varieties of tools are available at the disposal of a developer is a little tricky. So, in this article, we will talk about the tools provided for android app development services. The first thing you need is a Java development kit 1.6 or above. The reason behind this is that for android application development, it is the best language. It has its own kit, but other SDKs can be used too. C and C++ language also help in creating the app, but the time spent on it is not worth the quality received. Also, it is more complex than Java. This software lets you create other software like in our case a mobile app. The best feature of IDE is that it translates the language you are using for coding the app into Java. Other features include a debugging console and simulator for mobile app testing. • Eclipse: before the android studio, this IDE was used by Android app Development Company. It uses Java as well as other languages for coding and is still going strong. • Others: Corona, Cordova, DroidEdit etc. Even on the Android committee and YouTube, you can find lots of tutorials that will guide you through app development. This is a collection of documents that have codes for a number of things like templates, text, set rules of app behavior and much more. Most libraries are organized by topics, and almost every obstacle you face can be solved using these. The community is always open about their work, and you can use the code you require to make your own library. Plugins are short codes and add ons that helps the quality of the work you are doing and make it easy too. 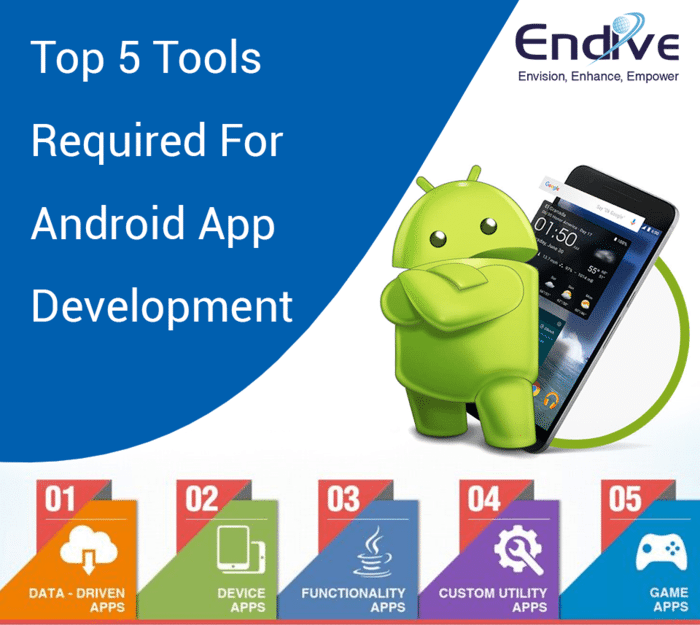 These are some tools that will help you create your Android app easily. I hope that the list I provided will make it easy for you to search for any codes or reference you might need. Happy Coding to you!